I'm a creature of habit. If I put something away in the same place everyday, I will never ever lose it. I always know exactly where it is because it's exactly where it ought to be. I'm also a neat and tidy person, so, odds are, everything in my house is exactly where it goes. I own one wide-toothed comb, and it's in the same place where I need it to be every day. My glasses, when they aren't on my face, are in their case. Each kitchen utensil goes back in its spot after I use it. Ninety-nine percent of this time, this system works flawlessly. On other occasions, I happen to put something in the wrong place for once...and I have no way of finding it because since it's not in its spot, I have absolutely no idea where it is. One time my grandma and I spent more than an hour looking for a textbook that wasn't in its spot. We ended up finding it under the bed. Who would have thought? Anyways, all this is to say, I recently got a reminder that I hadn't logged into an old Dropbox account for over a year upon logging in, I was curious to see what was actually stored there, and found a lot of wedding-related files, from planning and budget files to wedding photos, and, indeed, the classic 'photos of us growing up and meeting and deciding to get married' video. I didn't even know this video still existed anywhere, so it was a very happy surprise to find it in that long-forgotten Dropbox account. 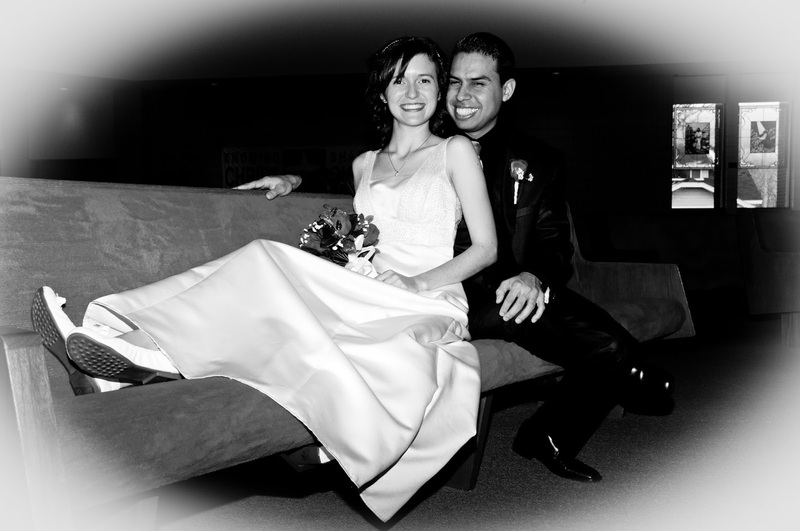 It was a very educational visit to Dropbox, because for a long time I haven't been able to remember what song I walked down the aisle to, and I was also informed by a file containing our wedding program that it was "God is With Us" by Casting Crowns. Amazing the things you can learn on the computer. Also, I have never had much access to any photos of Angel growing up to show you on the blog, so please enjoy some of these never-before-seen photos of us as wee things and in college together. I love how you can already tell he was a total mischief maker from his earliest photos. p.s. I also totally forgot about the "So, when can we get married? Next Wednesday?" which is what Angel asked when we got engaged in July and started planning our wedding. The wedding, however, was unfortunately pushed out to December due to logistics. Silly logistics. p.p.s. Do you forget about the existence and location of things the way I do? Also, I haven't been to many weddings in recent years...is the whole 'through the years' slideshow hopelessly out of date at this point? How fun that you found it! What a wonderful memory. Unfortunately it won't let me watch it here in Germany, but I am sure it's wonderful! I'm the opposite of you: I'm more of a messy person but I'm really good at remembering where I put things so I guess it's not that bad ;) You must be so happy to have found this gem! That wedding video is so cute!!! Those kinds of things are still done sometimes, too-I don't think you're hopelessly out of date :) I went to a wedding two summers ago where the bride had made one of these and showed it at the reception. It was quite intense, because the end of the video also included photos from the wedding that had taken place just before the reception started! I LOVE this. The video is adorable! I love that you were able to unearth off of those gems! Our wedding video is still on film....buried somewhere in my parents house. I probably should get that transferred. I'm not your classic "tidy" person but somehow I always know where everything is unless Jordan put it away. Jordan has a tendency to put things away in weird places. What an awesome find! I am so glad you found these precious memories right where you left them! Such wonderful memories, good for you that you found this gem! You two look so cute together. And I am totally the same way, not only do I forget where I keep things but I look for things that are already in my hand (like searching for my phone while I am actually talking to someone on the phone, holding it in my own hands, haha, talk about absence of mind ;)). What a fun discovery! My memory of is kind of crazy, I remember the strangest details! I also love Rich Mullins...great music! I love the slideshow. Is the "through the years thing" outdated? I don't know - we also had one 13 years ago. So probably. Of course it'll come back. And then everyone will be like, "I can't believe I had everything made out of Mason jars and pallets and an antique bicycle at my wedding reception! So dated!" Aww this would have been such a lovely thing to stumble upon again. Oh how fun! Love all the pictures. Thanks for sharing! My cousin made our slide show video and I don't think I have it. I do still have all the pictures I gave her to put in it though. I hope she still has it. Aww we had a wedding slideshow video that we showed at our rehearsal dinner. I still have it, but haven't watched it in years. I need to pull that out. :) Love all these old pictures of you guys!